Summer is here and that means the odds of you taking a dip in a pool or heading to the beach are rather high. Swim trunks are a part of the wardrobe that you probably don't think much about until it's too late. Selecting the proper fit and length can be a daunting task no matter what shape you're in. Once again, we're here to help! Follow this simple guide from "The Effortless Gent" to help you look your best when you're relaxing the most! Pay attention to the length. The biggest mistake Midwestern men make when selecting swim trunks is length. Swim trunks should not go past your knee. How high above the knee they should go is determined by your height. Tall Height: If you're a tall gentleman above 6' 3", they should be on the longer side near the top of the knee. This will help to offset your height and make your body look well balanced. Average Height: If you are of average height (5'10 to 6'2") they should be about 1" to 2" above your knee. Shorter Height: If you are of smaller stature under 5'9", they should rest about 2" to 3" above your knee. This will help to give you length and make your look taller. Lastly Consider Color, Pattern & Fit. Color: When selecting swim trunks, consider your complexion. Stay away from colors that will wash you out. Pattern: The Effortless Gent article that I referenced above doesn't have a lot of love for patterns, however, I think patterns can be a great way to express yourself when your're relaxing. Whether you select a solid or a pattern, make sure it is something that you enjoy and feel confident wearing. Fit: The fit should be on the slim/tailored side, but not tight. Using the above picture from Peter Millar as a reference, they should be no looser than what is pictured. (Side note: we don't recommend tucking your shirt into your swim trunks). 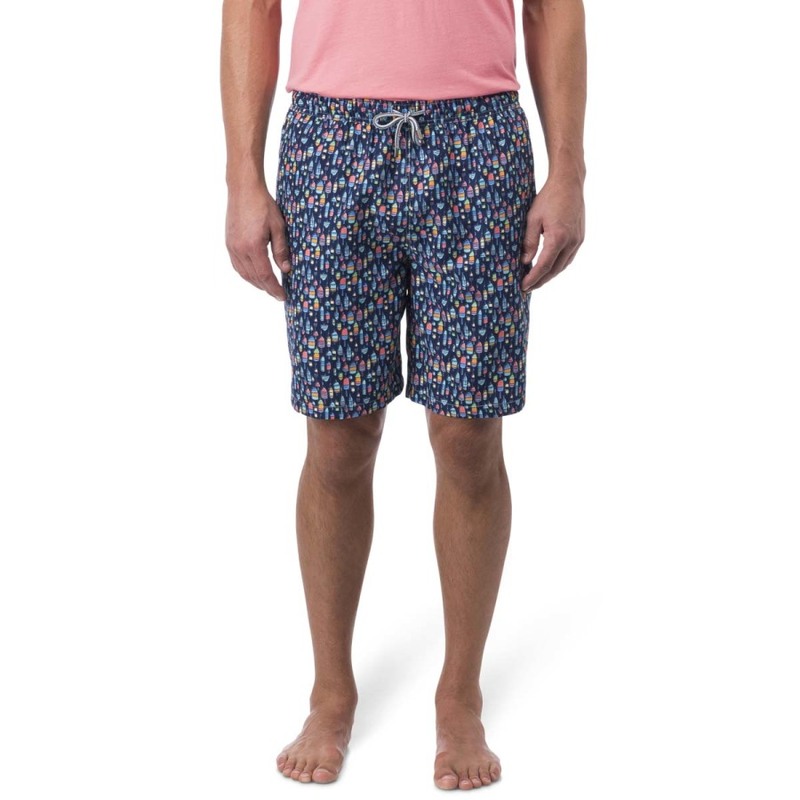 We have a variety of Peter Millar and Ted Baker swim trunks available for all your leisurely needs!